BRISBANE, Australia (AP) — A whale calf has been freed after becoming tangled in a shark net off the Australian east coast. 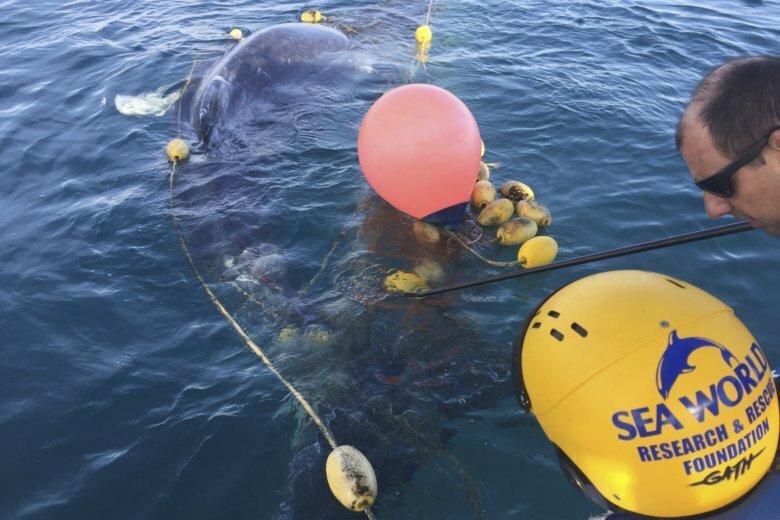 Experts from the Department of Agriculture and Fisheries and Sea World Gold Coast worked for almost two hours on Tuesday morning to untangle the humpback calf from a net about 500 meters (yards) off Greenmount Beach at Gold Coast city. The nets are suspended from buoys to protect swimmers at Gold Coast beaches from shark attack. “The calf had some superficial wounds form the entanglement, but nothing life threatening, and swam away with its mother when released,” Sea World Gold Coast said in a statement. Sea World director of marine sciences Trevor Long said the rescue was a distressing experience. “It was a very, very young calf — heavily engaged in the net, it was almost enveloped in the net — so quite distressing for the calf and quite distressing for the mother,” Long told Australian Broadcasting Corp.
“The mother was very close to the calf and very close to us and very interested in what we were doing,” he said. “I honestly believe the mother realized we were helping the calf and not injuring the calf and that was why she was calm,” he added. Long said the quantity of abrasions on the calf’s skin where it had been rubbed raw by the ropes suggested it had been tangled for some time. Someone walking on the beach had spotted the whale early Tuesday and alerted authorities.